It will sure reduce the welfare load but we will need to build a wall to keep them out of the rest of the country. As anyone can see both in Europe and the U.S. the colored are all running to the white countries. And imo those white countries are FOOLS to keep letting the hordes in. Their is only ONE that is more of a Racist than Farrakhan, & that’s OBOZO.. Problem is they can’t even run anything even with the infrastructure in place. They have proved that all over the world and even in the U.S. when they are elected to office in the U.S.
A better idea would two separate countries. One for liberals and one for Conservatives. Blacks can choose which one they want to live in. Those who work and support themselves and their families will go on the conservative side. The rest, well……. A prediction: The conservative states will be wealthy, free, equal, productive, etc. The liberal, welfare states will be broke and will try to take from the conservatives. Therefore, we will have a very high wall with machine gun nests on top. The conservative states will be beacons of liberty, free speech, equality and freedom. The liberal states will Venezuela. I’m with Louis. Let’s call it Liberia and put it on the West coast of Africa. The country already has the one star and 11 stripes. There you go. Problem solved. Then we can give them their independence. Amazing how the ecucated DNC types do know the blacks from the USA already have a guaranteed citizenship in Liberia for the asking. They can go to their state any time they want. And since last i looked, i don’t know of more than say a few hundred, who HAVE accepted that offer, to ME that shows the blacks here, don’t WANT to go. Only this nut-job does.. Sad to think of how many liberal politicians are associated with this racist (Obama, Waters, Ellison, Meeks and Green, to name a few). These are supposed to be leaders which black people are supposed to look up to. If they’re looking up to racism, I would say that the racists have been identified. There is nobody keeping black people here, they have the freedom to return to their homeland. The reason they don’t is welfare. Being on the dole is good. They just might have to work wherever it is they decide to go. In recent months? It seems that I recall something about this issue from more than a few months ago. Recent decades would be much more accurate. I don’t think i have ever heard him NOT BE anti-semitic in his speech. EVER. Here we go again. Remember back in the 60’s the Africans said if you would give us Florida, Georgia, South Carolina Alabama, Mississippi, Louisiana and Arizona we would be happy and the rest of you can keep the rest of the country.. Yes, give every minority in America (of course they must be US Citizens) the choice. Become a regular US Citizen where race/religion/color/culture has nothing to do with your life – we are ALL EQUAL, OR move to a special “state” where ONLY your race/religion/color/culture is allowed and all others are banned! I suggest California since it is already race/culture biased, and shut down those borders. So all Hispanics, Blacks, Browns, Asians, green, yellow, blue folks can live in CA but no one else. Now, they are not allowed to leave CA either – they must stay in CA for their entire lives! Their choice! And CA will no longer be part of the USA, so no representation in Congress or the Senate, no US taxes, no US protection, no US military, no US immigration/ICE! That works for me! Anyone surprised? Can you imagine if a white man said that? The man defines the word “racist”. There should be a picture of him posing with the KKK titled “Brothers In Arms”. Nope. I am not shocked this abject rabid racist would say such drivel… Its to be expected from dolts like Louis..
For once I actually agree with Louis. He should leave, along with the Black scum who follow him and the rest of the Rags too and claim a state of their own. It will save the tax payers a lot of money in welfare payments. After that, we build a wall around that state and never hear from them again. The wall will allow the scum who want to live there an entrance to sneak over but will not allow them to exit back into the US. But why give up a piece of OUR country, to do this? Especially when we ALREADY have too many issues (and scalliwags) in office refusing to secure our border WITH OTHER countries.. Now you expect them to say OK, to a separate state’s border wall’?? A separate state would probably be best. I suspect that his idea is that we just GIVE HIM his choice of states with all of the infrastructure in place, business and homes and all goods that are there. As some here have said it’s not a new idea. But none of his ideas are new. Face it. Louis Farrakahn worships a demon god. This is what God wants for the blacks… For all Christians. Allah is not God. He’s a vicious violent punk god. A god here for gathering losers together who deny reality and refuse to take responsibility for their own shortcomings. God’s grace gives us strength in our weaknesses. But, Louis’s god builds up hate in finding ways to deny ones own weaknesses. I root for Alcatraz Island. Nice idea.. But how many could it hold?? 20k or so? 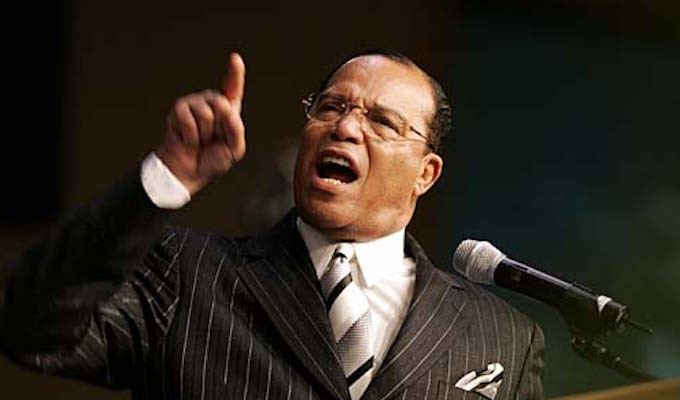 Farrakhan and his ilk are invited to go anywhere outside of the US, and set up his own state, as long as it is not part of the United States of America. He must relinquish his American citizenship in the process (maybe they should take his microphone away as well). So… what part of him is he going to segregate ? He is not pure black, most of us are not just one race, we are a combination of many races so how does that work ? See how stupid his plan is ? He has been preaching this since they shot old Malcolm. I haven’t seen anyone go anywhere yet. At one time they talked about all moving to Louisiana and Mississippi then leaving the union. I thought we should give them New York and New Jersey but where would we put all the white libs from up there? Maybe Illinois and Wisconsin? California would be nice but again where would we put all the libs that they throw out when they take over? There are many “nation-states” occupied and administered by blacks. Uganda, Somalia, Liberia, etc. Not a single one of them stable or prosperous. Which state does he feel should be given over to a religious sect of racists? I’m sure we can have a war about this if that suits him. It seems that at some point we’re going to so let’s get it over with. Maybe Canada will donate some land. Or Mexico. But I doubt many people in Montana, New Jersey, Texas or California are willing to give up their homes. But I’m figuring Canada and Mexico would put up a fight, just like they should. And so will we. Gotta wonder….how many blacks who have earn successful lives would emigrate to this wonderland of black and Muslim rule? They have one already. It is called Liberia. We built it for them, and they use our currency, and they turned it into a s*ithole. South Afrika is now turning into another one. Everywhere the white people have been and created a prosperous country when they kicked us out, that country fell into a poverty-stricken country. I have been advocating that America needs to divide into two new nations for over a decade now. The difference is that my proposal is based on political ideology, not race. Let the communist liberals have their nation where they can abort as much as they wish, tax as much as they want, let in all foreigners who wish to live there, remove all weapons from private individuals, and eliminate the freedom of speech. Yes, they can have everything they want in their new nation….except control over those who don’t wish to live there. The conservative nation will be based on our current Constitution, but with additions like term and work limits for all politicians and government workers, and a balanced budget amendment. Find a border acceptable to both sides with water access on both coasts and set a date 10 to 15 years in the future when those new nations will come into existence. Let people use that time to make arrangements to sell or buy a home or a business and move somewhere within the borders of whichever nation they wish to live in. Any legal American can choose which nation they wish to live in, but on the set date, they will become a citizen of that nation and have to abide by its laws. There will be a grace period where if anyone on either side changes their mind within two years, then they will be given admittance to the other nation. I’m willing to bet the population of the conservative nation will far exceed that of the communist one. Is this a return to segregation, which was so wrong just half a century ago? Well, we saw both last year and in 2016/17, schools PUSHING for ‘segregated’ housing/classes and such, ALL BY BLACKS for blacks, and it was being CHEERED and supported.. So segregation is OK, when the left/blacks/minorities are pushing for it.. Just not when whites do. Black Americans were given the choice to go to their own country – Liberia. How did that work out? Great. They can have their own nation, preferably somewhere in Africa where they will feel at home among people who look just like them.They were offered their own country, Liberia, but only a few ex-slaves wanted to go there. In Liberia they will have to make arrangements with the people who already live there. That won’t be easy!! No-one wants a bunch of nasty malcontents, but there will be no white people walking around looking happy and privileged, enjoying the good life the US offers everyone willing to work for it. What they cannot have is any part of our United States of America which they hate with a passion. Goodbye Luis. Good riddance.